Ready to tackle that big job you’ve been putting off? Maybe you’re ripping out the knotty pine in the den or the turquoise tile in your bathroom. Maybe you’re clearing out the garage, the backyard, or an entire house. Whatever the project, River City Rubbish can help. 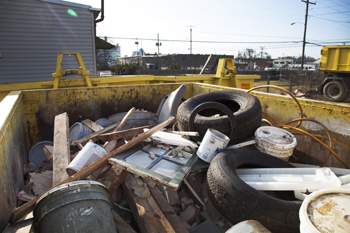 You have a few options for waste disposal in Richmond VA. You can haul the trash yourself to a local landfill, paying a fee (and losing valuable time) every time you go. You can call a full-service junk removal service and have a crew haul everything for you —but you’ll pay a big price. 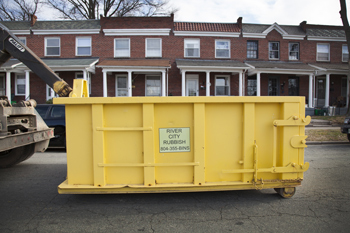 The easiest, most affordable solution in Richmond: residential dumpster rental from River City Rubbish. Read our Google Reviews here. Give us a call at 804-355-2467 or fill out the form below to reserve your container now! Please read your rental agreement for a full description of what may be placed in your dumpster. If any of the items listed in the exceptions are found in the dumpster, additional fees will apply. How does residential dumpster rental work? River City Rubbish makes it easy. Call us and we’ll deliver the right size residential dumpster for your job. When you’re ready, let us know it’s time to collect your container. The one-time fee includes delivery of a residential roll off container for up to 30 days, picking up the container, hauling it to a local landfill, and all the Richmond VA area dump fees. If you’re doing major demo on a small room, or cleaning/renovating two rooms, we typically suggest a 10 yard dumpster rental. For bigger jobs, such as clearing a houseful of junk, you’ll want a 16 yard or 20 yard dumpster. It’s always best to go up a size if you’re not sure, so you can avoid the cost of having a second residential dumpster delivered. Our experts can advise you on the right size for your job and your location. What can I put in my rental dumpster? We accept all kinds of construction debris, such as wood, shingles, tiles, fixtures and yard waste. Exceptions include: lead-painted materials, asbestos, paint cans (unless dry), flammable liquids, solvents, chemicals, Freon, and batteries. Because of local landfill regulations, we do not accept household trash (biodegradable/food waste), tires or mattresses. If any of the items listed in the exceptions are found in the dumpsters additional fees apply. Where do I place my rental dumpster? Small dumpsters can create big challenges. 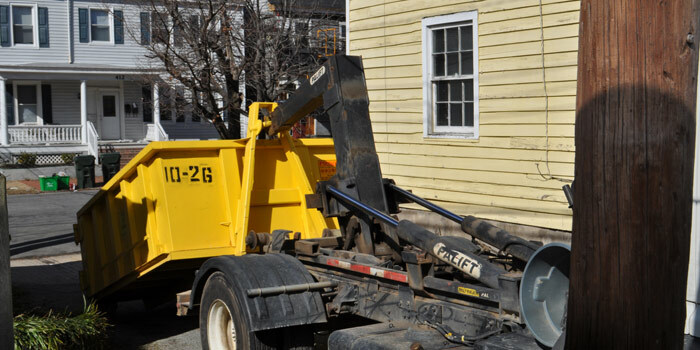 In Richmond neighborhoods like the Fan and Church Hill, it’s critical to find the right spot to place a rental dumpster to comply with city codes and regulations. We have 10 years experience working in Richmond VA and all the surrounding areas, including Chesterfield, Henrico, Chester and Goochland. We’ll assess your site and carefully place your container. Why should I choose River City Rubbish for residential dumpster rental in Richmond? Richmond residents have trusted us for 10 years. Read our Google reviews to see what our satisfied customers are saying. We get it there for you. We pride ourselves on getting the dumpster there the day you request it to be delivered. We make it easy for you. We work with our customers to help them get the right size residential dumpster in the right place, for the right amount of time.